So, we’re back in Ha Noi having spent almost three weeks travelling the length and breadth of England – with a bit of Wales thrown in for good measure! The three and a half months between arriving in Ha Noi, in March, and going on holiday seemed to fly past and we were just beginning to find our feet when it was time to go ‘home’. Which brings to mind the question about where is ‘home’? Being an ex. pat. you become a little confused I think – home is where we live and that is Ha Noi but it’s also where those we love live and in our case that’s the UK. When we were on holiday we found ourselves talking about Ha Noi as home, partly perhaps because all our possessions are here and Sally (dog) was in kennels. Is home then where you have roots or a tie, or people? If it’s people, is it where the majority of the people you care about live? Maybe it’s wherever your heart says is home. For me, right now I have two homes: Ha Noi because it’s where my husband and Sally are and the UK because it’s where pretty much everybody else that I love and care about lives. Our holiday had been planned around my youngest sister’s wedding celebration (the original ceremony having taken place in Noosa ) and, happily for me this coincided with Bruce Springsteen’s tour of the UK with the East Street Band. Four of us went to The Etihad Stadium in Manchester on a very bleak, wet, grey evening in June to hear the band play their hearts out for 3.5 hours. Awesome and a lesson for many of today’s ‘celebrities’ on showmanship. It is not unusual for there to be tension or under currents at family get togethers but, unless I missed them entirely, our day was fantastic – credit to the bride and groom for their thoughtful planning I think! However, in-keeping with wedding tradition, the bride looked absolutely stunning. They say that every girl wants to be a princess on her wedding day and my sister looked every bit like a fairytale princess. We spent the next two weeks driving like maniacs around the country visiting relatives and friends and enjoying the cool weather (I know, I know, who’d have thought I’d enjoy cool rain so much but after the humidity of Ha Noi it was sooooo refreshing!). By the time we got back on the plane we were both slightly frazzled and ready to relax – thrilled though we were to have seen so many loved ones. The day after landing back here, we were off again. 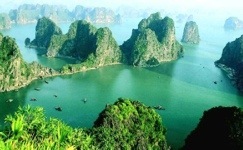 This time taking up an invitation from some great new friends to join them on a week end cruise to HaLong Bay . It is one of the 7 natural wonders of the world and breathtakingly beautiful. I will try to insert a photo at the bottom of this post.